From our earliest beginnings, Space has been a constant and incalculable influence on the development of humankind. Its vast unreachable beauty has seduced philosophers and theologians to establish the fundamental belief systems of our world. The challenge of cosmic unknowability has inspired scientists to achieve technological developments of great audacity and hubris. It has also had big impact on popular music of the last fifty years. The birth of rock and roll coincided with our first faltering steps into Space and so it is little surprise that the airwaves of the late fifties were cluttered with cosmic boogie. The post-war baby boomers of the fifties embraced the modern and looked to the future, keen to hip-shake away the austerity of the past. In 1957, as Sputnik became the first artificial satellite to orbit the Earth, the airwaves below were cluttered with such songs as Skip Stanley’s Satellite Baby, Jackie Lowell’s Rocket Trip or Sonny Sheather’s Orbit With Me. 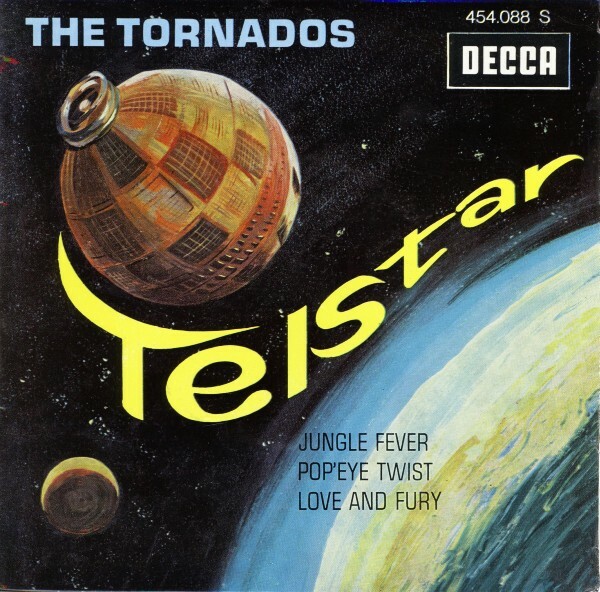 One of the biggest hits of this era was Telstar by The Tornados, an instrumental that reached the US Number One spot in 1962 and was rather unromantically named after one of the first communication satellites. Space travel represented an aspiration for a better world and the Space Race imagery of this new technology would come to define a generation. Between 1961 - when cosmonaut Yuri Gagarin undertook the first human spaceflight – and 1969 - when Neil Armstrong became the first man on the moon - Space exploration would remain a pop music preoccupation. However, for the hippy generation unlike the unreconstructed rock and rollers before them, it was no longer the technology of the establishment that seduced them. We can see this conceptual shift in the cheery country rock of The Byrd’s Mr Spaceman (1966). Here, frontman Roger McGuinn asks not that humankind reaches out to conquer Space, but instead begs that some alien being comes to invite us to the stars and release us from the boredom of our little world. Presumably, McGuinn immediately regretted this plea to “take them away” as his band members would thereafter be abducted by west coast supergroups on a frustratingly regular basis. 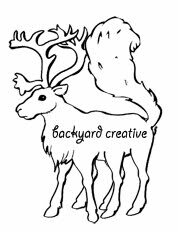 It’s no coincidence that a cosmic theme would dominate an era of astral projection and chemical experimentation. For a youth who longed to be free from the ridged conventions of oppressive conservative society, Space was the ultimate trip, man. It was a place to find freedom and transcendence. The Grateful Dead’s epic Dark Star (1968) was literally a psychedelic space capsule designed to carry the listeners out to the farthest reaches of cosmic consciousness, without the necessity of multimillion dollar technology, whilst Deep Purple took us on an altogether more raucous and booze fuelled musical tour of the solar system in Space Trucking (1971). 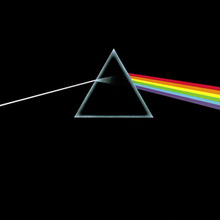 Pink Floyd’s Interstellar Overdrive (1966) - complete with a musical nod to the Ron Grainer’s Doctor Who theme – would be a practice launch for their later progressive rock journey to The Dark Side of The Moon (1973). But even if the tie-dyed daydreams of the hippies and rockers were the privileged affectations of a predominantly white middle class, the promise of freedom delivered from beyond the stars still proved a universal and multicultural attraction. In the Beyonder cycle, prototype hip hop collective The Last Poets embraced the ‘otherness’ of African American culture by reflecting on a fictional history of a black diaspora literally descended from an powerful alien race. Perhaps this was the only way to explain the terrible inequalities and indignities of segregation and - in this narrative - there was also the promise of cosmic emancipation at some point in the near future. Jazz bandleader Sun Ra and funk icon George Clinton both took this concept of 'Afrofuturism' even further. Sun Ra claimed that he was of the "Angel Race" and was not from Earth, but Saturn. He developed a complex persona using cosmic philosophies and lyrical poetry, leading his "Arkestra" on a free jazz journey that pioneered the electronica and the space rock genres. 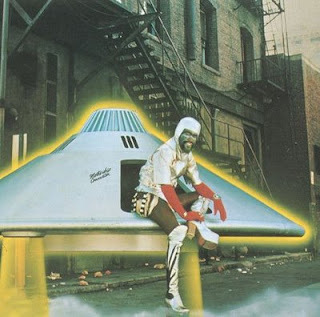 George Clinton arrives on the Mothership. George Clinton also adopted an outrageous extra-terrestrial persona, who arrived on Earth and onstage in The P Funk Mothership, accompanied by his agents of Supergroovalisticprosifunkstication. An integral part of the P Funk mythology, the Mothership existed both conceptually as a fictional vehicle of funk deliverance and as a physical prop central to P Funk concerts. Powered by unknown means, presumably The Funk and simple stagecraft, the Mothership appeared over the Planet Earth many times during the second half of the Twentieth century and was even seen to physically land at a number of live music venues in the United States during the 1970s in order to disgorge its Funk to the people. Perhaps The Arkestra and the P Funk Mothership weren’t exactly what easy listening and uneasy siblings The Carpenters yearned for in their rather odd cover of Klaatuu's Calling Occupants of Interplanetary Craft (1977), but at least they too tried to reach out to the zeitgeist. During the 1970’s, the counterculture and the Space industry both faced a dramatic comedown. Each had searched furiously for something greater beyond the confines of our little world and had discovered little more than a vast, empty nothingness. Encapsulating this mood, jazz poet Gil Scott Heron was more concerned with down to earth matters and saw the Space Race as an unnecessary technological distraction in times of great social and racial inequality. After all, how relevant was the arrival of Whitey on the Moon (1971) when “the man just upped your rent again”, “the price of food is going up” and you “can’t pay no doctor bill”. Here, Heron angrily vocalised the ambivalence of deprived, impoverished and segregated communities still here on earth to the fabulously expensive and ultimately futile endeavours of the entitled establishment. Even Elton John’s hit single Rocket Man (1971) reflected the bittersweet notion of astronauts no longer being perceived as heroes, but in fact as an "everyday occupation". Nevertheless, whilst increasing scepticism that our utopian future might be written in the stars dampened enthusiasm for the psychedelic excesses of the cosmic, Space still proved a compelling canvas upon which to project the rhythmic, melodic poetry of our teenage symphonies to lust and longing. 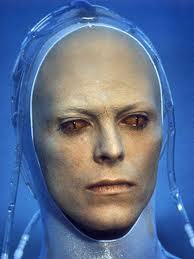 Proof that more alienating times only serve to increase the allure of the alien can be found in the career of David Bowie. Bowie practically pioneered the persona of the pop star as alienated alien - quite literally in his eponymous role as The Man Who Fell to Earth (Nicolas Roeg, 1976). Bowie’s Space is a surreal and strange place of dreams and malleable meanings. Space Oddity (1969) may reflect either the plight of the Apollo 8 astronauts or simply Bowies own drug use and desire to let go of the world. Life on Mars (1971) is like a love song as painted by Salvador Dalí. The infinite possibilities of Space offered a context for Bowies abstract cut-up lyrics and invested them with an anthemic believability that would have been quite impossible if tethered to the gravity of our everyday lives on Planet Earth. At it’s heart, pop music promises escapism and the greatest escape of all will always be into the stars – whether literally or figuratively. Sci-fi Hi-Fi is the embodiment of aspiration, whether lofty or - in the case of Mötley Crüe's longing for a "lady with a body from outer space" or Ash's whimsical Girl from Mars (1995) - lustful. It’s no surprise that during the Acid House explosion of the late 1980s Space again became a preoccupation of the ravers of the self-styled Second Summer of Love. In terms of intergalactic obsessions there were many parallels with the First. Psychedelic electronica outfit The Orb made many ambient musical journeys into Space, most notably on U.F.Orb (1992), a concept album of bizarre soundscapes documenting the bands fascination with alien life. One of the defining anthems of this period would be The Prodigy’s Out of Space (1992), which samples from the Max Romeo’s classic reggae track, I Chase the Devil (1976). Romeo's lyrical cry - “I’m gone send into Outer Space, to find another race” - was originally a call to reject the Devil and banish him to a distant galaxy, but in the hands of Ecstasy kids it became the chant of another jilted generation once again reclaiming their birthright to escape to the stars. 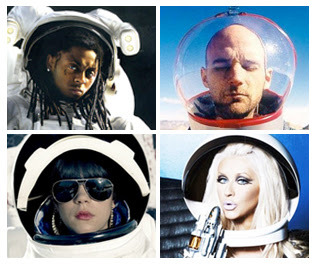 (Clockwise from top left) Lil' Wayne, Moby, Lily Allen and Christina Aguilera. There is still no shortage of galactic longing. Since Bowies defining first appearance it has become a regular occurring trope for the distinctively unusual, idiosyncratic or just plain kooky pop performer to present themselves as something quite alien. Kate Bush, Tricky, Bjork and Lady Gaga have all flirted with this at some point in their careers. It was even recently reported that Beyonce and Jay-Z were in talks with commercial spaceflight provider Virgin Galactic to shoot the first music video in Space. 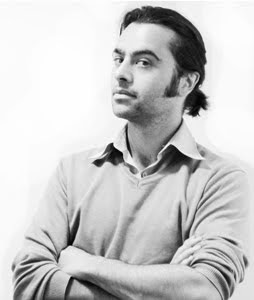 As Oscar Wilde observed, whilst we are all in the gutter, some of us will always be looking at the stars. In fact, in more austere times, those who look to the stars appear even more glorious and alien. What the music of these eras share is optimism, sometimes for what we have achieved up to now and sometimes for what we could achieve in the future. On reflection, Space seems most often associated with hope and, in these challenging and distinctly down-to-earth times, perhaps we could all do with a little more cosmic in our boogie and sputnik in our bowl.